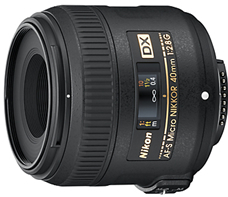 July 13, 2011 /Photography News/ Nikon Corporation yesterday announced the release of the AF-S DX Micro NIKKOR 40mm f/2.8G, a normal Micro lens for Nikon DX-format digital-SLR cameras offering a focal length of 40mm and a maximum aperture of f/2.8. As a normal Micro lens that easily enables close-up shooting as close as 0.163 m for life-size images exhibiting pleasing blur characteristics, the AF-S DX Micro NIKKOR 40mm f/2.8G is a new model in the DX-format lens lineup. It is a compact and lightweight lens available at a very reasonable price for those new to digital-SLR cameras and those currently looking to add to a lens purchased as a set with a Nikon digital-SLR camera. In addition to a built-in Silent Wave Motor(SWM) that enables the quiet autofocus operation vital to close-up photography of insects and animals, the AF-S DX Micro NIKKOR 40mm f/2.8G also offers a number of convenient features, including two focus modes—M/A (autofocus with manual override) and M (manual). Nikon has long had the support of professional and advanced amateur photographers for its consistent development of innovative products that respond to the demands of users and are equipped with the optical technologies Nikon has spent years cultivating as a manufacturer of optical devices. Nikon intends to continue to expand and strengthen the NIKKOR lineup with the steady release of new, high-performance lenses that offer advanced functions.